Puzzle: Not an easiest puzzle to make – good lighting is a bonus. 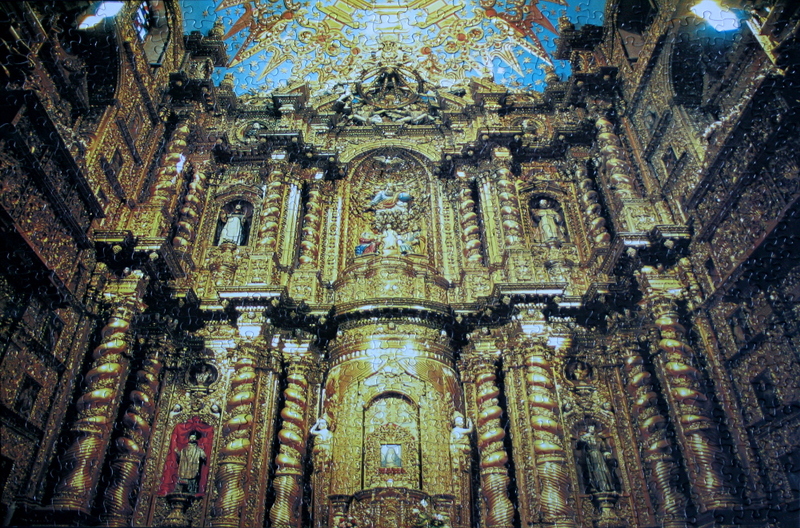 Easiest places to start are the blue of the dome, the bright gold of the centre, the figures in the alcoves, the darker parts on the edges, and the golden pillars. Pillars provide good vertical guides, and pillar tops can serve as horizontal ones. The pieces fit together well making for a fun but a bit challenging puzzle to assemble. Notes: It is unfortunate that no information is given on the box on where this photo was taken. If you know where this is, I would love to know. architecture, church, interior, puzzle. Bookmark.